An estimated 55 million Hispanics live in the U.S., approximately 17% of the country’s population, according to the Census Bureau. Further, there are more than four million Hispanic-owned businesses throughout the U.S., and their collective annual revenues have climbed to more than $668 billion, according to the U.S. Hispanic Chamber of Commerce. Furthermore, the number of Hispanic-owned businesses has doubled since 2002. Had these businesses not been created, unemployment rate would have risen to over 10% for the first time in over 30 years, and the recession would have inched closer towards a depression. Hispanic firms helped put a floor on the financial collapse, and helped pave the path toward America’s economic recovery. Hispanics will account for 40% of employment growth over the next five years and more than 75% from 2020 to 2034. In this issue we want to recognize and celebrate businessmen and women who represent the best of our community. They are critical to our economic recovery and strength, to building America’s future, and to helping the United States compete in today’s global marketplace. Hispanic-owned businesses are fast becoming the bell-weather for future growth. Their relatively young age cohorts, increasing household incomes, and impact on the financial sector paint a very positive picture for the American economy during the next decade or more. that going forward, Hispanics will have more economic clout, employ a greater proportion of the population and purchase substantially more in goods and services than they do today. The dynamic growth of Hispanic-owned businesses will keep transforming the economic and political landscape in the United States in the years ahead. America through supplier diversity programs - a win-win business strategy that is both principled and profitable. We are delighted to publicly acknowledge these business leaders as trailblazers in their respective industries. The way we buy goods and services has dramatically changed over the last decade thanks to the so-called “sharing economy.” This phenomenon has shaken up the employment landscape. Services are now performed on demand by people with the skills, tools and spare time to complete them. More and more people in a growing number of sectors have become part of the “gig economy” in the form of freelancers, contractors and part-timers. Reasons range from supplementing incomes to a more flexible work schedule. To be sure, we have become a world of part-time workers for a number of reasons. Capitalizing on this growing trend is CorTech. Founded in 1999 by Vincent Rossy and Gary Nichols, the duo had the foresight to create an innovative business model that combined Rossy’s acumen in IT with Nichols experience as a former owner of a clerical staffing company. The pair recognized a void in the traditional staffing market space and launched CorTech. The aim has always been to mesh the opportunities employers look for with a skilled workforce that is required to make any businesses succeed. CorTech’s mantra is to “do things the right way.” The company’s corporate culture is based on value, honesty and an unwavering commitment to the delivery of services. Headquartered in Atlanta, CorTech has been providing temporary staffing solutions in the United States, Canada and Puerto Rico to United Parcel Service Inc., also based in Atlanta. CorTech became a key vendor to UPS in 2010 via its relationship with the UPS-managed service provide Manpower-Tapfin. Without question, CorTech’s partnership with UPS was a major turning point for the company. Indeed, UPS is a global powerhouse in the package delivery and logistics market. Founded in 1907, UPS is one of the most recognized and admired global brands. The company’s U.S. domestic package segment offers time-definite delivery of letters, documents, small packages and palletized freight through air and ground services in the U.S. The international package segment provides guaranteed day and time-definite international shipping services in Europe, the Asia Pacific, Canada and Latin America, the Indian sub-continent, the Middle East, and Africa. The supply chain and freight segment offers international air and ocean freight forwarding, customs brokerage, truckload freight brokerage, distribution and post-sales services, and mail and consulting services in some 220 countries and territories. UPS operates a fleet of approximately 110,000 package cars, vans, tractors and motorcycles, and it owns 33,000 containers used to transport cargo in its aircraft. The company employs many retirees who are looking for the next chapter and seek reduced hours with benefits. The primary part-time positions are for package handlers who load, unload or sort within the operations. The company does not discriminate when it comes to age, focusing instead on a person’s ability and desire to do the job. That’s where CorTech comes in. CorTech understands that to stay ahead, organizations like UPS must run efficiently. And that starts with the best employees. CorTech makes it a priority to understand a client’s business. Allowing CorTech to stand out is its track record for delivering on its promises, and taking every partnership personally and seriously. CorTech’s steadfast dedication to quality, experience, leadership and results are unrivaled in the staffing industry and have earned them the utmost respect from their peers. “We provide staffing services with a sense of respect and integrity,” Rossy said. CorTech staff will always take responsibility for all actions and will not hesitate to seek advice in pursuit of new opportunities to improve a client’s brand, which in turn improves its own. Eighty percent of success in business is simply showing up. No one knows that better than the Delaco Steel Corporation, an aluminum and steel manufacturing service center that specializes in blanking (exposed and unexposed), cut to length, laser welding, precision slitting, warehousing and logistics. Since being founded by Geraldo Diez Sr. in 1973, Delaco has aggressively shown its mettle and muscle by showing how the family-owned business can successfully compete with big players in the space. Today, the Diez Group lead by Geraldo, who works tirelessly with his four children: April (Vice Chair), Sherry (Vice President), Jerry Jr. (President), and Mark (Vice President). The company has evolved into a conglomerate of eight thriving companies that span approximately 2 million square feet within 10 facilities across a half dozen states. Each operation is strategically located to optimally service its key customers. Delaco’s chief and long-time customer is Ford Motor Co. Delaco started its storied business partnership with Ford in the late 1970s. Soon after, Delaco developed a string of major contracts with Ford involving steels sales, processing and storage. Their partnership has grown significantly over the years thanks to Delaco’s business prowess, attention to detail and commitment to the iconic American automaker. “We were instrumental in launching Ford’s Raw Material Supply Program in the early 1990s,” April Diez told Latino Leaders Magazine. “Delaco Steel strives to maintain world-class quality and on-time delivery. In 2010, Delaco spearheaded a scallop blanking initiative, which proved to be a major material and cost savings to Ford. To qualify as a MBE under an Environmental Protection Agency program, an entity must establish that it is at least 51 percent owned and/or controlled by socially and economically disadvantaged individuals who are of good character and are citizens of the United States. In addition, Ford encourage Tier 1 suppliers to meet their minority objectives. That, in turn, provides Delaco with additional business opportunity with the Tier 1s. Without question, Ford has been tremendously instrumental in the growth and development of the Diez Group. Delco is proudly the largest Hispanic company within the automotive manufacturing supply chain. Its business connection with Ford is a true partnership. How does a small Dundee, Michigan, packaging company form a prosperous partnership with auto goliath Toyota Motors Corp.? The answer: with some strategic partnerships and steadfast grit. Milagro Packaging LLC, which provides packaging services and material such as plastic, foam, corrugated, metal and wood, has enjoyed a thriving partnership with Toyota since 2001, when it formed a joint venture with Concept Packaging. The collaboration allowed Milagro Packaging to offer a minority option to Toyota, which enabled the small-cap company to offer more products and services to the auto giant. Key to Milagro Packaging’s successful performance as a Toyota supplier has been establishing a close working relationship with the automaker and its associates at all levels of manufacturing and distribution, Milagro Packaging founder Dolores Rodriguez told Latino Leaders Magazine. “Working across all of the business units of Toyota, suppliers, NAMCs, TMS and TEMA have been an important part of our relationship,” Rodriguez said. Toyota has been instrumental in helping Milagro Packaging become a better company and supplier by providing guidance and assistance throughout their 16-year relationship, Rodriguez explained. Despite all of the company’s successes, Ms. Rodriguez explained that she constantly faces an increasing number of challenges as a small business owner. Without question, Toyota has been a major player in Milagro Packaging’s growth. Also playing a big role in the company’s growth is the United States Hispanic Chamber of Commerce. USHCC is America’s largest Hispanic business organization, representing over 4.2 million Hispanic-owned businesses across the United States that together contribute more than $668 billion to the American economy annually. The organization also serves as the umbrella organization for more than 200 local Hispanic chambers and business associations in the U.S. and Puerto Rico. For more than three decades, USHCC has been the leading voice for Hispanic business owners in America. From its inception, USHCC’s mission has been to foster economic growth that creates and sustains prosperity for the benefit of the American people. “UHSCC has been very helpful in introducing me to other companies so that I can expand our customer base,” Ms. Rodriguez added. As a pioneering entrepreneur and successful business owner, Ms. Rodriguez is always and aggressively looking for news opportunities and new ways to grow the company’s revenue stream. To be sure, scale and scope are important in today’s hyper-competitive market place. Helping Milagro Packaging thrive are supplier diversity programs. A supplier diversity program is a proactive business program which encourages the use of minority-owned, women-owned, veteran-owned, LGBT-owned, service disabled veteran-owned, historically underutilized business, and Small Business Administration (SBA)-defined small business concerns as suppliers. As for what advice this blossoming businesswoman has for other business owner seeking opportunities, Rodriguez stresses the importance of joining a regional supplier diversity council. In a recent phone interview with Latino Leaders, Arizona Sen. John McCain said it could be argued that the fastest-growing small businesses in the United States are owned by Hispanics. McCain said there are more than 120,000 Hispanic-owned business in Arizona. Hispanic Purchasing power in the state is in excess of $40 billion, he said, and women own more than 54 percent of Hispanic small businesses. One of the vital components of all this success is trade with Mexico, he said. In addition to trade, McCain said, there’s the cultural relationship to consider. McCain said he is glad that President Donald Trump’s administration seems to have softened its recent rhetoric regarding a proposed 20 percent tax on imports from Mexico to pay for a southern border wall. On many economic issues, McCain said he agrees with the administration. Reducing taxes and regulations can be of enormous benefit to the Hispanic community and Hispanic-owned businesses, McCain said. President Trump has indicated that he wants to renegotiate the North American Free Trade Agreement (NAFTA). McCain said NAFTA has been proven to be an incredible success, and wholesale changes to it could trigger chaos. McCain said he hopes that cooler heads will prevail. The success of Hispanic-owned businesses in Arizona and other Southwestern states provides an example to the rest of the country, the senator said. “I am incredibly proud of the economic success of our Hispanic citizens and the contributions they have made to Arizona,” he said. regulations will change from what they have been because he believes it would help. “I would hope that they would benefit from the emphasis on addressing some of the regulatory barriers to economic growth,” Flake said. “I am hoping the Trump administration will continue to where I think they have started to go in getting rid of these barriers. Flake said changes to the tax code as well as a simplification of the code would be beneficial. The senator also told Latino Leaders that there were a few things that could be done to help the promotion of Latino businesses, such as helping banks lend more easily to Latinos. “Access to capital is a tough thing and that is making it difficult for small businesses to grow,” Flake said. He added that the Dodd-Frank Wall Street reform bill has worked to push a lot of smaller lenders, which are more apt to lend to small businesses, into larger lenders that are not. At the same time, businesses do not want to get too big because of Affordable Care Act laws, which require a company to provide health care if a business is larger than 50 employees. Flake said in the future he hoped the regulations would ease. Flake said he thinks the market works well when business are not worried and trying to comply with heavily imposed regulations all the time. Flake recognized that there is some stagnation with growth among Latino businesses. He said with immigration reform and other governmental factors, there could be a slowing in stamina. “I tried with another of my colleagues, to put out immigration reform that would give more certainty moving ahead to a lot of individuals who are either working in the shadows or are undocumented — or kids that really aren’t able to use the education they received,” Flake said. 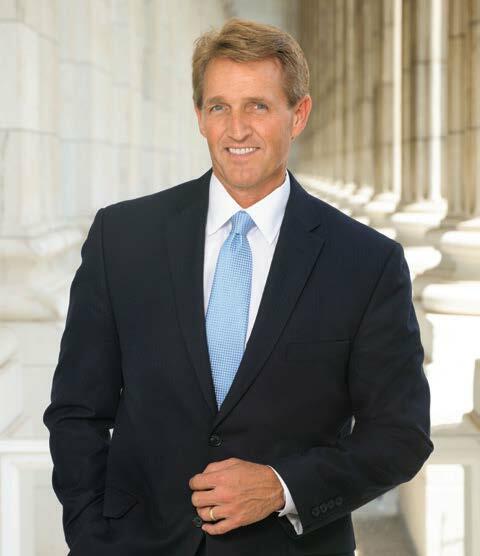 He said he was a supporter of the Bridge Act, which would work to provide more children with permanent status in the U.S.
Flake said he also wanted to continue to foster good relationships between the United States and Mexico. “This talk about sending military troops down or just building a wall, that doesn’t do much for neighborliness and we ought to recognize that trade is not a zero-sum game,” Flake said. “It helps us both, or all of us who are involved in it, and security cooperation can be improved. But it’s only improved if we actually value the relationship we have trade and otherwise with the neighbors.” The senator said he grew up in a rural Arizona ranching community and worked alongside migrant labor. “We benefited significantly from the relationship we had with those who wanted to come and work,” Flake said. “Many did not have legal status and now do. I have always felt motivation to recognize all the benefits when we have willing workers to take jobs they want to do. USHCC has compiled a list of top brands that honor diversity. These enterprises have given minority groups an opportunity and have paved the way for other companies to do the same. The USHCC firmly believes in the inclusion of businesses owned by women and minorities, in an effort to broaden the economic development. •Kaiser Foundation Health Plan Inc.
•American Honda Motor Co., Inc.
For more details on all of these profiles and indexes, check out our PDF version or purchase a print copy!